This post lists some best free currency exchange rate APIs that you can use. Here these APIs let you see the latest currency exchange rates as well as the historical exchange rates. In these APIs, you just have to specify some parameters in the API call URL and get the output in JSON. The API URL can be used directly in the browser or you can use command line tools like wget, cURL, etc., to do the same. Apart from getting exchange rates, you can use these to convert currency in others formats as well by making some simple API calls. In the following list, I have added some free APIs that you can use without any restrictions. However, in some of these services there is a limited free plan that is reasonable for small-scale use. The endpoints and syntax to do different things via these APIs are very simple. You just make API request and get response in JSON format. After getting the data, you can do whatever you want. You can use these APIs easily in your web and mobile applications. You can see detailed documentation about these for different programming languages as well. ExchangeRatesAPI.io is one of the best free currency exchange rate APIs out there. You can use this API for free and without any API key. You just construct the API call URL and then simply paste that in browser or use command line tools. It supports operations like currency exchange rate, conversation, and see historical exchange rates. Just make an API call to the specified endpoint and get the data. It returns data in JSON format and after getting that, you can do whatever you like. This is an open source currency exchange rate API and if you want then you can host it on your own server or on a developers platform such as Heroku. As I have already mentioned that you don’t need any API key to start using it, so you just start making the API call URL. 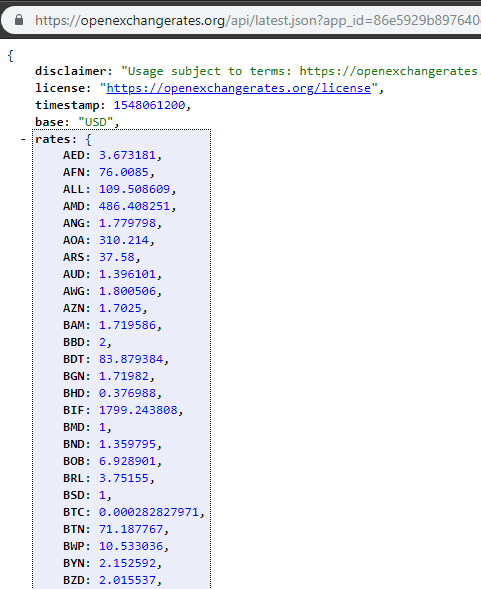 In the URL, you have to specify the currencies for which you want to get the exchange rates data and a base currency. Also, you can opt to see only specific currencies in the results if you want to. See an example of the API call to see the how much 1 INR costs in specified 4 currencies. See the above example result of this API and analyze how it works. You just make the API call this way and get the results. You can see the output it produces and in the similar fashion you can implement this API in your web and mobile applications. See detailed API documentation on its GitHub page. Fixer.io is another free and open source currency exchange rates API that you can use. However, in the hosted version, you are only allowed to make 1000 request per month. You just create a free account and get the API key and then start using it. In the free plan another limitations in that you cannot set a base peace and the conversion feature. You just query latest and historical exchange rates and get data Simple as that. After getting the API key, you can go through its documentation and then implement this in your applications easily. Use the above link to reach the homepage of this website and then simply sign up for a free account. After that, you can simply start creating the API URL. For that you can see documentation of this API and there are a lot of examples given here. You can even see the examples of using this API in some programming languages as well. 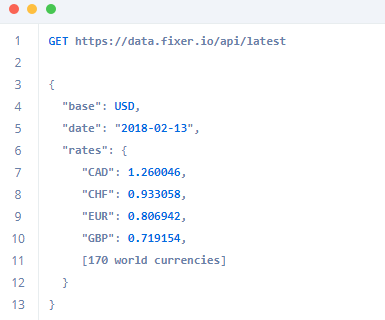 Below is an example of using this API to get latest exchange rates for other currencies while the base currency is set to EUR. You can see the JSON data that it fetched in my case. You can do the same. Also, if you want to get data from any specific date then you can do that very easily. Open Exchange Rates is s a simple and flexible API that you can use to get latest currency exchange rates data in JSON. To use this API, you just have to obtain a free app id from its homepage and use that to fetch currency exchange data. However, for free, you can only make 1000 request per month. It can show you the latest currency data as well as the historical currency data by just making simple API calls. Sign up for a free by using the above link and then you can generate the app id for you. After getting that, you can start creating the API call URL and start fetching the latest as well as the historical exchange rates. See the example of the API call below to fetch the latest prices for all the currencies with respect to USD. After getting the data in JSON, you can do whatever you want with it. If you want data in other formats then you can use some tools to convert data from JSON to CSV, Excel. In this way, you can use this simple free exchange rates API. Just get your key and start fetching the currency data and use that in your applications. You can read the detailed documentation for this API here. See the different API parameters and syntax to different tasks. Using them, you can easily use this API in your applications. These are the best free currency rate exchange APIs that you can use. 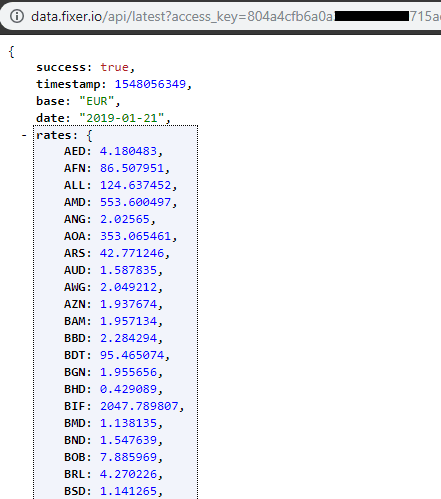 Use them to get latest as well as historical currency exchange rates in JSON format by making simple API calls. All these APIs are very good for web and mobile applications. The free plan is good for small-scale use but if you want more requests per month then you can upgrade to the paid plan of these services as well. However, you can give try to ExchangeRatesAPI.io as it is free and you can self host it easily on Heroku.